From the Departments of Neurology (M.S. ), Clinical Neurosciences (T.B. ), and Neurosurgery (J.C.T. ), University Hospital Munich, Campus Grosshadern, Munich; and the German Clinic of Diagnostics (S.v.S.-B. ), Wiesbaden, Germany. A 55-year-old man reported having recurrent spontaneous attacks of rotatory vertigo lasting 1–5 seconds and occurring up to 10 times daily and often associated with attacks of right ear tinnitus for more than 3 years. Caloric testing showed a right peripheral vestibular deficit. Cervical vestibular myogenic potentials showed impaired function of the right saccule. An audiogram was normal. MRI (figure, A and B) showed that the eighth nerve was in contact with the anterior inferior cerebellar artery. Vestibular paroxysmia was diagnosed.1,2 Carbamazepine resolved the symptoms but the patient discontinued it due to side effects. The symptoms recurred, and surgery was performed. Intraoperatively, compression of the eighth nerve was found (figure, C and D). He has had no further symptoms and takes no medication. These findings support the view that vascular compression of the root entry zone of the eighth cranial nerve can cause vestibular paroxysmia. 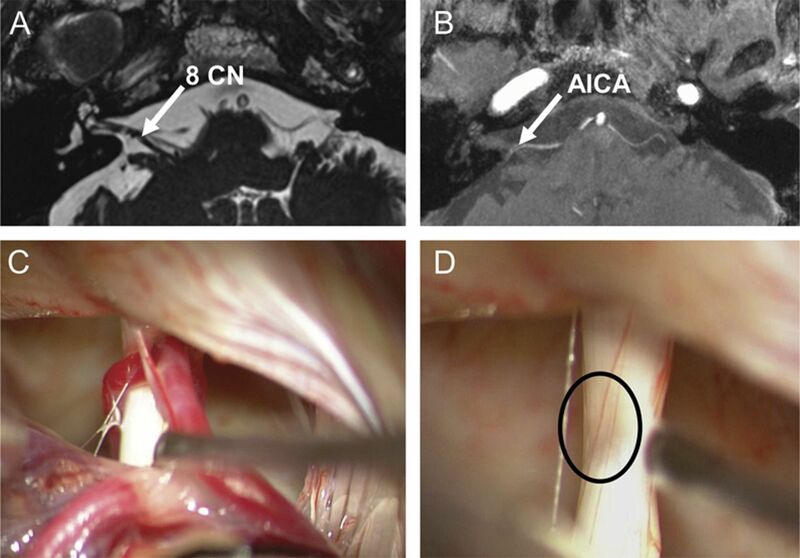 Cranial MRI (A: constructive interference in steady-state sequence, B: time-of-flight) shows contact (arrows) between the right eighth cranial nerve (CN) and the anterior inferior cerebellar artery (AICA). Intraoperative micrographs demonstrate vascular contact (C) and considerable compression of the eighth nerve after removal of the arteries (D, circle). M. Strupp: drafting the manuscript for content, including medical writing and idea for the case report. S. von Stuckrad-Barre: initial examination and treatment of the patient, drafting the manuscript for content. T. Brandt: discussion of the case, drafting the manuscript, including medical writing. J.C. Tonn: operation of the patient, taking micrographs, drafting the manuscript for content, including medical writing. Institutional (German Ministry of Education and Research [BMBF]) grant 01EO0901 to the IFB, German center for vertigo and balance disorders at the University of Munich, Campus Grosshadern, Germany. M. Strupp is supported by grants from BMBF no. 01EO0901 to the IFBLMU and the BMBF and DFG. S. von Stuckard-Barre reports no disclosures. T. Brandt is supported by grants from BMBF no. 01EO0901 to the IFBLMU. J.C. Tonn reports no disclosures. Go to Neurology.org for full disclosures. The authors thank Dr. Jennifer Linn for evaluation of the MRI scans.
. Vestibular paroxysmia: vascular compression of the eighth nerve? Lancet 1994;343:798–799.
. Vestibular paroxysmia: diagnostic features and medical treatment. Neurology 2008;71:1006–1014.